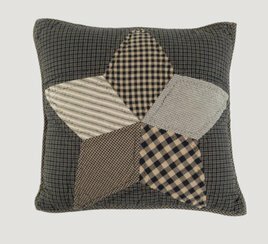 A great finishing touch for your country primitive home is the Farmhouse Star Filled Pillow Quilted. A large single 5-point star nearly stretches from edge to edge. 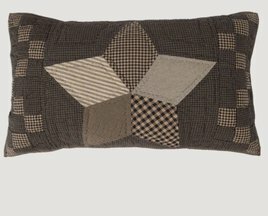 Reverses to charcoal on dark creme ticking stripe and two black chalk button closures. 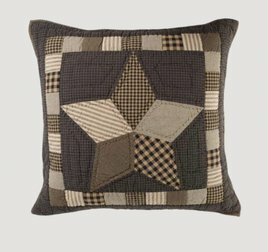 You're going to love this Farmhouse Star Pillow! 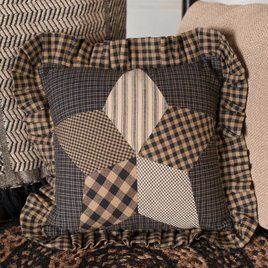 This filled throw pillow can be used in any room of the house where you need a little extra something to bring together your color scheme. Size 10" x 10".